The DKN AM-5i ergo exercise bike comes with an 11kg (24.2lbs) flywheel ensuring smooth operation and has a 2 coloured backlit LCD display console which perfectly integrates iPad, iPad Mini and Android tablets (3.1 or higher and 1280 x 800 min resolution) to allow for challenging workouts with the revolutionary DKN-Motion application. Additionally, users can discover the world’s most iconic tours thanks to the i-Routes feature enabling them to explore some of the most popular cycling routes without the need of leaving the flat or house. 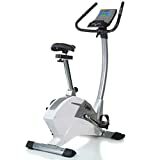 This sturdy machine offers 32 levels of computer controlled resistance to make each workout more efficient and satisfying. The DKN-Motion application allows users to design, program and perform their workouts any time they want, as well as to store up to 12 customised user profiles with workout data. The bike has 1 manual, 12 pre-set and 3 user-defined programmes, plus HRC and Watt training options . A great thing about the DKN-Motion application is that it allows for using the tablet/iPad for browsing the internet or doing other things while exercising and it will be still running in the background giving you access to any Multitasking. The console of the DKN AM-5i ergo exercise bike is supplied with the intuitive intelli-key lighting system and adapted to show which zone to train in. The machine is also compatible with the DKN iWorld application which enables you to take your workout to any place on the globe, use Streetview, follow the real terrain elevation and check the progress in the iLog. Heart rate with the DKN AM-5i can be achieved through the hand grip sensors, or for ultimate accuracy a chest strap (optional) can be used with the built-in wireless receiver.